My speech is 172 pages long, so if you want to run screaming from the room, do it now! No need for panic though. There are only a few words on each page and I rarely stick to my script, so you’re in luck. When Mike Albrecht asked me if I’d be willing to spend some time with you this afternoon, he said he was looking for someone who could provide you with a vision for the future that is both optimistic and realistic. Then he added that he wasn’t sure that the words “optimistic” and “realistic” could exist in the same sentence. They can; in fact, they just did! But like the word “hope,” neither “optimistic” nor “realistic” are strategies. Fortunately for you, I am not here to talk strategy. I am here to entertain and encourage you, especially those of you who think you might like to be loggers someday, and those of you who still wonder how and why you got into the logging business. I sometimes ask myself the same question, and even though I know exactly why, when and how I got into the forestry education business 33 years ago, but there are still days when my long-ago decision doesn’t make any sense to me, especially when I look at the balance in our bank account! But then there are days when it makes perfect sense. I don’t know if this means I am schizophrenic, or that I don’t know what hell I’m doing, but hope to get better at it if I just do it for a few more years. There’s that word again – hope. How many loggers in this room are in their 20s? How many of you are over 60? How many of you are between 30 and 60? How many of you are teenagers and hope to make logging your profession? A decade ago the big worry was whether any high school kid would want to follow in their family’s logging footsteps. Logging was often vilified by classroom teachers with agendas of their own. There was no future in it. It was a dead-end job, the last buffalo hunt, what the dumb kids did when they weren’t hanging out on street corners at night. Clearly, some of you weren’t listening when your teachers were accusing your family of killing the planet – which is reason for hope among those of us who have raised worry to an artform. Until that moment, we did not have a title for our $200,000 production. Now we did. I no longer remember the young man’s name, but his fresh face and enthusiasm were the epitome of the youthful image your profession needs. It has been my great pleasure to get to know many loggers in my life. Like the rest of us, they have life stories to tell, and sometimes they tell them in words and sometimes they tell them in the way they conduct themselves. My great uncle, Jacob John Hendricksen, was one of the latter. He was the first logger I ever met. I think I was five when mother and dad and I stopped at his house in Coeur d’Alene, Idaho, remarkably only about two miles from where Julia and I live today. By then Uncle Jake was retired and probably in his late 60s, though he looked much older. Years of packing 70 pounds of tools – axes, wedges, oil cans, a hammer and a misery whip up and down steep slopes every day – rain, shine or snow – had bent him at the shoulders, but he was still an imposing figure, with his Billy Graham shock of snow-white hair. Uncle Jake cut big white pine for the old Edward Rutledge Timber Company in northern Idaho. Rutledge was partly owned by Potlatch, which owned what was then the largest sawmill in the world. It was on Old Highway 10, just east of Coeur d’Alene. The mill ran 24-7 for decades. The Coeur d’Alene Resort’s world-class 18-hole golf course occupies the old mill site today, and its floating green bobs in blue waters once filled with big log rafts. Time marches on, and things change, but the world is not using less wood than it used in the 1940s. It is using many times more, which is again the hope part. My great aunt wasn’t a logger, but she cooked for the Linfor Lumber Company’s early camps on the North Fork of the Coeur d’Alene River, not far from Kellogg, where I grew up. Ethel Petersen was known to be the best and the toughest cook on the river – tough in the sense that she refused to allow loggers to talk in her dining rooms. I once asked her why she didn’t allow talking. The moral of this story is that you should never ever get sideways with the camp cook, especially if she is your mother or your wife. My Aunt Ethel was also the finest fly fisherman I’ve ever watched. Most of what I know about pitching flies I learned from her when I was seven and eight years old. She was as big as she was tough, so when we waded into the North Fork, she put me on the downstream side to protect me from the fast-moving current. The first time I saw God part the Red Sea for Charlton Heston in The Ten Commandments, I thought of Aunt Ethel. Ethel introduced me to Bill Nearing, a North Idaho legend who was the toughest logger I’ve ever known. He fought Jack Dempsey to a bloody draw in an exhibition match before 14,000 spectators at Gonzaga Stadium in Spokane in the summer of 1927. Dempsey knocked Bill down four times and knocked out four of his teeth, but Bill knocked him down once. When the referee stopped the fight, Bill was still standing, and he collected a hundred bucks for the beating he took. Big money in 1927. Bill and Dempsey became friends and exchanged letters for years. Mike Petersen and I exchanged words many times during the spotted owl wars. He is the executive director of the Lands Council in Spokane. Although we’d never met, we were on opposite sides of the owl debate, and so we argued long and hard on editorial pages. The lesson here is that common ground is the best ground to work, so never say never where you and your adversaries are concerned. Plow deep and you might find a new friend. I certainly did. Now Mike and I try to help one another meet our shared goals, which generally involve finding ways to stuff the Wildfire Genie back in her bottle. In 1971, I met a California logging legend named John Yingst. Is there anyone here who remembers him? His office was in a shack in the middle of Simpson Timber’s log yard at Samoa. My old friend, Dave James, who was Simpson’s vice president of government relations introduced us. At the time, I was working on a series of articles for the Grants Pass Daily Courier concerning what was then the latest of the clearcutting debates in the Douglas-fir region. Dave thought I should meet Yingst, so he drove from Seattle to Grants Pass and we drove to Eureka together. It was spring, so the mud surrounding John’s office was shin deep. He must have seen us coming because he swung open the door and yelled “Hello” to us. When he shook your hand his grip was vise-like. He was an imposing figure not unlike my Uncle Jake, but what I remember most about him is that he wore cork boots in his office, which had a wooden floor that he had reduced to sawdust and splinters. Aunt Lena would have killed Uncle Jake if he’d even come near their back porch with his cork boots on. Yingst was kind enough to take me to the woods with him so I could watch his loggers fell big redwood trees. It was quite an experience, watching huge bulldozers make dirt windrows that cushioned the massive trees when they fell. Until that day, I never knew that redwoods sprout from stumps, just like apple trees. Wow! Now I think I understand what Ronald Reagan meant when he said, “If you’ve seen one redwood tree, you’ve seen them all.” Environmentalists hated him for saying it, but now I suspect most of them wish he was still President! I also knew Ray Frost. He lived in Cave Junction in southern Oregon’s beautiful Illinois Valley, and logged mainly on the Siskiyou National Forest. Although Ray’s days began before sunup and ended well after sundown, he still found time to sit on the Josephine County Budget Committee, and when the idea of starting a community college on the old Job Corps campus in Grants Pass was being discussed, Ray was one of the first to stand and be counted – he along with my old friend, Lew Krauss, Jr. who with his two brothers owned and operated Rough and Ready Lumber on Highway 199 south of Cave Junction for more than 50 years. Rough and Ready is gone now – one of hundreds of casualties of the slow-motion collapse of the federal timber sale program. 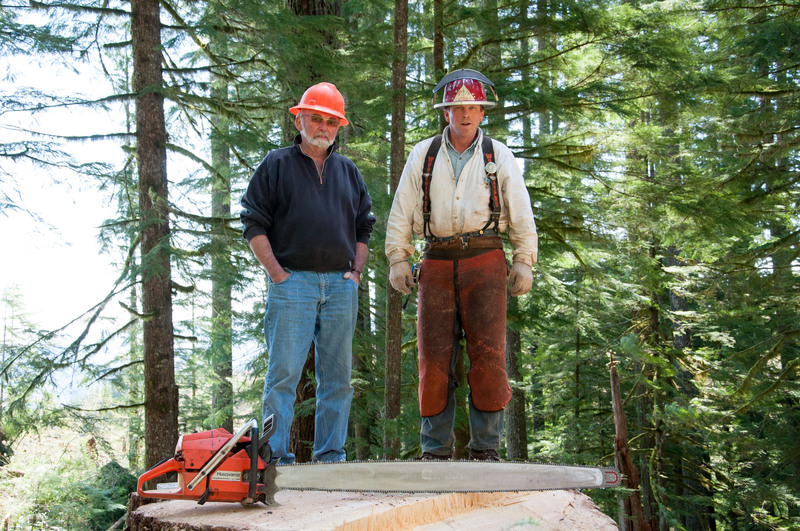 Lew and Ray are gone, too, but the community college they and dozens of southern Oregon lumbermen got behind more than 40 years ago is still going strong. How many of you are involved in civic activities in your communities? If you aren’t you need to get involved as quickly as possible. Find your comfort zone and do it. Your town needs your help and you need their support because – as others have surely told you by now – the world is run by those who show up, and if you aren’t at the table, you’ll soon find yourself on the menu. I also interviewed a bright young timber faller from Medford, Oregon named Mark Keiser. I knew his dad well, and I figured if Mark was anything like Dave, I was in for a good day. And it was. We shared lunch in the shade of a big ponderosa and we talked about his seemingly bright future for as long as he had time. I put Mark on the cover of the next issue of Evergreen: July 1988. It was the last time I ever saw him. He was only 34 when a falling limb killed him less than a year later. He left a wife and 2 or 3 small children who are in their 30s now. This is your reminder to be careful out there. Split-second decisions can spell life or death. Make damned sure they spell life. We need you. Be safe. Buck Gaylord was woods boss for Oak Mine Timber Company, a subsidiary of Spalding and Son, another Grants Pass casualty of the federal timber sale collapse that began not long after we started Evergreen Magazine in 1986. Buck was a barrel-chested man whose best defense was the permanent scowl he wore on his face. He also wore a wool stocking cap – even when it was 105 degrees in the shade. I admired Buck – so much so that I interviewed him and put his scowling mug on the cover on one of Evergreen’s first editions. There he is in his hickory work shirt with pens and pencils crammed into both pockets. You can tell by looking at him that he wasn’t crazy about me taking his picture, but he allowed it anyway because he realized that what we were doing was introducing southern Oregon residents to logging and sawmilling families who were doing most of the heavy lifting in their local economies. About that same time, I spent a day in the woods with Les Olson, a handsome man with a big graying goatee and a steel pot on his head that glistened in the noonday sun. Like Buck, he wore suspenders, and like Buck, his hickory shirt was unzipped about half-way down. But there all similarity ceased. Les loved to have his picture taken, and my camera loved his piercing steel-blue eyes. I have a picture of him standing on a five-foot stump with a mile-wide smile on his face. This guy was right out of central casting. Les logged mainly for South Coast Lumber at Brookings, and he was a walking encyclopedia where logging was concerned. I’d go back to the woods with him any day, which reminds me to tell you that, as much as it may pain you, you need to get acquainted with your local news media. If you don’t fill the silence between their ears with your story, someone else will fill it with theirs or, worse, untrue and hurtful stories about you. In today’s world, all those stories – the good ones and the bad ones – travel at the speed of light on social media. Burl Lyons, a newspaper publisher I worked for 50 years ago, made it his job to call advertisers who were behind in their monthly bills. He’d listen sympathetically to their tales of woe about how bad business was, then he’d remind them that he could understand anything but silence. Were Burl here this afternoon, he would implore you to fill the silence with your own truth, participate in the public discourse that newspapers and the electronic media provide at no cost to you. Never miss the opportunity to take your local news reporters to the woods. Explain what you do and why you do it the way you do it. Show them the results. Explain the result. Paint a word-picture of the future forest that will soon be growing where you just finished logging. Some reporters have their own axes to grind. They will cut your throat in a heartbeat. Nothing you can do about that. But most journalists will appreciate your help, and when they have questions, they’ll call you before they pull the trigger. You can’t buy that kind of trust. Leverage it often. Send your reporter friends cell phone pictures from the forests that are your home away from home. It’s a cheap and easy way to stay connected. My other great, Nora Wallace, didn’t log either, but she liked hanging around logging camps when she was in her early 20s. I’m guessing the loggers liked her too because she was a showstopper. One time when I was 9 or 10 years old, and she and I were hiding behind the loading dock behind my grandmother’s apartment house in Spokane – smoking cigarettes – she turned to me and painted a word picture that I can still call up from memory whenever I want to savor the great relationship we had. I some ways, she was more like a big sister to me than an aunt. Then we’d smoke another cigarette and I’d wait for the next story about life in Avery, which I always understood to mean life after sundown. Nora was in Avery when the three million-acre 1910 Fire swept up the St. Joe River and wiped out most of the town. She and others escaped on a train headed east for Missoula, Montana. The engineer stopped in a tunnel on the Idaho-Montana divide thinking it would keep his passengers safe from the raging fire, but then he realized they’d all die of carbon monoxide poisoning, so he made a run for it across a burning trestle. “Geez, were you afraid,” I asked, as any 10-year-old brother would ask his older and wiser sister. When she stepped onto the passenger platform in Missoula the first thing she noticed was the varnish still running down the wooden sides of the train cars. It had been that hot in the St. Regis Canyon. For obvious reasons, I thought my Aunt Nora was the bee’s knees. I loved her dearly, and I know that my grandmother, who never drank or smoked, and wrote margin notes in her Bible, loved her younger sister too, because when Aunt Nora died unexpectedly in 1959, my grandmother cried. I also know my grandmother was tough as hell because she ran my grandfather’s three sawmills for 11 years after he died of pneumonia in 1928. Some of the margin notes in her Bible were written in those years. She had a few things she wanted to talk over with God. I suspect He lost the argument. I was my grandmother’s only grandson, so she indulged me in endless flights of fancy. She knew I liked to swim in the pool at Manito Park in Spokane, so we’d walk the 25 blocks from her apartment house on West Fourth to Manito – me in my shorts and PF Flyers and she in her high-heel granny shoes, dress, hat and elbow-length gloves. She would not have been caught dead in the slacks, blouse and slippers her sister wore daily. On a scorching July afternoon, as we were readying ourselves for the 25-block walk back to her apartment, I occurred to me that my formally-attired grandmother, who ran three sawmills through the Great Depression, and was stately in a way most women aren’t today, and who never remarried, was very likely the toughest woman on earth. The lesson here is being tough doesn’t mean you have to look or talk tough. My grandmother was an elegant women, but she was tough in ways that must have scared the hell out of her millworkers. 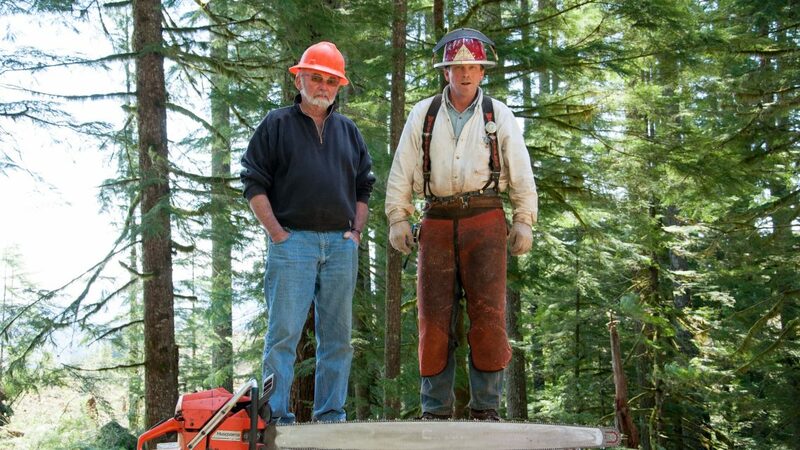 I have known one big-time logger in my life: Wes Lematta. Some of you knew him, too. Wes and I were friends for more than 40 years. We met in Gold Beach, Oregon in the spring of 1971, about the same time that I met Buck Gaylord and Les Olson. At the time, Wes and Jack Erickson were pioneering a helicopter sale on the Gold Beach Ranger District, using an S-64 they had leased from Sikorsky. Initially, Sikorsky wasn’t crazy the idea of leasing to Wes and Jack because they feared they would break the helicopter and the U.S. Army would find out about it, which wouldn’t be good for business because the Army was buying lots of S-64s at the time and would not have been pleased to hear that the helicopter wasn’t as tough as advertised. I met Wes and Jack over bowls of clam chowder in a roadside café in Gold Beach. Although I did not know it at the time, they were about to part company. Differences in personalities and management styles were the main reasons. Jack was a hard charger. Wes was relaxed and introspective. Wes and I stayed in touch, and I continued to write about what I’d seen from a log landing at Lobster Creek, above the Rogue River. First for the Grants Pass Courier, but also for several trade publications, including Dean Sherman’s Forest Industries newsletter in Portland and Miller Freeman, a long-gone trade magazine publisher in San Francisco. During my Pacific Logging Congress years, Wes and I talked frequently. He was a generous contributor to Evergreen Magazine because he believed in the same forestry story we believed. Then came the day Wes invited me to lunch at his home near Battleground, Washington. I had wanted to talk with him about a book I was writing, but he had something else on his mind. He wanted me to put together a different book chronicling the 50-year history of Columbia Helicopters. It is fair to say I was speechless, but I readily agreed to do it. Neither Wes nor I had any idea what we were in for, but he was sure it would be better than the book a publisher in London, England had been hounding him about. I had to agree with his belief that their hero-worshiping storyline didn’t fit Wes’s quiet persona. I began by interviewing Wes and Nancy. I wanted to know their story. It turned out that she was much more than the mother of their children. She was the fledgling company’s bookkeeper when they started out in 1957. They were living in a drafty old house in east Portland, close enough to the Columbia River that winter winds drove snow under the doorsills and around the window casings. I leaned across the table and asked Nancy what it was like. No husband likes to hear those words from his wife – especially if she is also his bookkeeper. “Evvery Friday,” she replied, dragging out the word every. “I just kept working,” he replied, his trademark smile much in evidence. “You just kept working,” I said, as if to do my own sound check. “I just kept working,” he said again. Here before me sat two seemingly ordinary people – a husband and wife – humble and practical to a fault – who had built the largest heavy-lift helicopter company on Earth, with close to 1,000 employees working on six continents, not just for timber outfits, but oil and mining companies, public utilities and the Forest Service. Wes invented most of the tools you find in big helicopters that are used on wildfires: the bubble window, the bladders and the pumps. And he just kept working. I looked back at Nancy – and she was nodding slowly in the affirmative. And now they wanted me to write a book commemorating their helicopter life together, something they could give to their employees as a thank you gift. And Wes intended to personally sign every book – and he did. The lesson here – and this is for the youngsters in this room – is to just keep working, no matter what. Keep working because there is no substitute for hard work, especially in the face of adversity and disappointment. Never forget the power and beauty of Wes Lematta’s business model: Just keep working because you never know what payday might someday bring. Wes died on Christmas Eve, 2009. Last November, Nancy sold the company they built together from scratch for a stunning $562 million. Some of you knew Tom Murray. He was a legend among western Washington loggers. Tom and I were friends for a good many years. He was the only logger I ever knew whose career spanned steam, railroad logging and skyline towers. I wrote his life story, Running the Gauntlet, a few years ago. Tom’s story is three stories in one. It begins with his father coming west from Cincinnati, Ohio in the early 1900s, never having seen a Douglas-fir in his life. L.T. Murray made a sizeable fortune buying and railroad logging high elevation timberland no one else wanted. Tom made his fortune by refusing to give up on the timberland his father had acquired, some of it before Tom was born in 1926. Tom’s son, Toby, L.T. Murray III, carried that tradition forward until the Murray family decided to sell its fabled 54,000-acre West Fork Timber Company to Sierra Pacific in 2015. The lesson here comes from Kenny Rogers: Know when to hold ‘em and know when to fold ‘em. My best friend is a logger. Some of you know him. His name is Bruce Vincent, and he is easily the most electrifying public speaker I’ve ever heard. We met at his home in Libby, Montana, not long after the 1988 Great Northwest Log Haul. Some 300 log trucks from western Montana and northern Idaho had hauled one million board feet of logs to a mill at Darby, south of Missoula that had run out of logs and was closing. The reason was well known: The Forest Service wasn’t selling enough timber to fill mill demand, so the many log home manufacturers located along the highway to Darby were buying their lodgepole logs in British Columbia. It was ridiculous given the fact that the entire Bitterroot Valley is surrounded by timber, much of it dead or dying lodgepole. The event made national news. I saw it by accident, walking through my southern Oregon living room during the NBC Nightly News. I watched in amazement, and as you might imagine – I wanted to meet the guy who put the event together, and that was Bruce. The result was a second event: The Silver Fire Roundup at Grants Pass in August 1989. Knowing the Forest Service’s long history of fire salvage and replanting, we organized what turned out to be the largest peacetime convoy in U.S. history. On a beastly hot Saturday in late August, 1,540 logging trucks from five states rallied at the Josephine County Fairgrounds to show their support for salvage. At one point, the line of trucks waiting to exit Interstate 5 at Grants Pass stretched 25 miles to the north. I can’t remember how many trucks came from Montana, but one of them was a Vincent Logging Company truck driven by Clarence Pepiot, a jolly soul who would drop dead in front of his wife in their kitchen two years later. I know this because I wrote about it – including the part about Northwest Montana loggers faithfully hauling poor Clarence’s wooden casket to the Libby cemetery on a lowboy festooned with yellow ribbons that had become the rallying cry at the Silver Fire Roundup. Our symbol of unity – a short piece of yellow flagging that was normally used to mark cutting strips – but now tied to car and truck antennas – soon spread to hundreds of timber communities all over these United States. Bruce was the main event in Grants Pass, though he would tell you that the main events were the families crammed into 1,540 truck cabs. He told a grandstand filled with screaming spectators that it was “okay to be a logger.” And it sure as hell was – if only for one day. It was 108 in downtown Grants Pass and you could feel the electricity in the air as, one by one, more than 1,000 logs trucks rolled down Sixth Street. They were making history and everyone on the sidewalks knew it because no one had ever seen anything like it. Bruce had jotted down a few notes on scraps of paper as I was about to introduce him, but a gust of wind blew them off the podium. There he was, buck-naked in a manner of speaking, with 10,000 clinging to his every word, though as we all soon learned, Bruce doesn’t need notes – ever. I watched a whirlwind toss his scribbling into a park lot, then did what writers do: I grabbed a napkin and wrote down what I could as fast as I could with a stubby pencil. You can find a summary of my hastily scrawled notes on our Evergreen website. Read it when you get discouraged or lose your way. And don’t be afraid to switch horses when the one you are riding gets tired. Bruce did. He became one of the most sought-after speakers in the country. Sadly, Vincent Logging folded, just like the mill in Darby and for the same reason. Happily, the company is now back in business. Bruce and P.J.’s oldest son, Chas, who I have known since he was a boy, recently restarted the company. He is the fourth generation and his future looks very promising because there is strong public support for the kind of thinning needed to reduce the godawful metastasizing risk of wildfire. No one will ever give you better advice. And no one I know personifies Winston Churchill’s never-give-in model better than my friend Dave Ehrmantrout, a logger from Priest River, Idaho. Dave was a high production guy for years, but he got tired of living on the road, so he reinvented himself. Now he mainly does small jobs for the Forest Service. Julia and I have spent a good deal of time in the woods with Dave and his sons. They are big- time artists in a small-time world occupied by loggers whose skills and equipment can transform overgrown thickets into picturesque settings that look more like city parks. The potential for the service Dave and his sons offer is huge, but so are the risks which – as you also know – are all political. The leave-it-to-Nature crowd hates what the Ehrmantrouts’ do, but the public loves it, because it is beautiful, which makes the “Zero Cut” crowd hate their work even more. I confess I’m having a pretty good time watching them marginalize themselves in one hyperventilating doomsday declaration after the next. What the Horshack’s of this world hate even more than Dave’s work is the fact that most of the projects he takes on have been vetted – sometimes even designed – by local forest collaborative groups that work with the Forest Service, and represent the diverse interests and values of local conservationists who have decided that letting Nature take its course in our national forests isn’t a very good idea. My friend, Alan Houston, a PhD wildlife biologist who runs the forestry operation at the Ames Plantation at Grand Junction, Tennessee describes the underlying wisdom here as well as I’ve ever heard it described, so you might want to jot this down for future reference. We were out walking on the Cumberland Plateau one crisp fall morning in 1996 when, out of the blue, he turned and said something so unforgettable that I can still quote it from memory. Talk about quotable quotes. I can’t tell you how many times I’ve quoted Alan over the last 20 years. So here’s the take-home message: If you have not yet joined a forest collaborative group – and they are popping up all over the west – I suggest you do so immediately. You will make new and often politically influential friends representing an impressive range of outdoor interests that mesh well with the whole idea of managing forests rather than watching them burn. 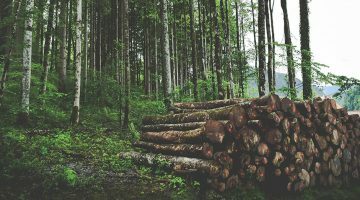 First because wood processing technology has finally caught up with the critical need to remove small diameter trees from overstocked and dying forests before they burn. Second because centrist conservation groups see what these terrible wildfires are doing to their reputations and their efforts to protect the public’s outdoor playgrounds, and they don’t like what they see. And third because conservation groups now collaborating with lumbermen and local citizen groups are tired of not getting their needs met. I know this to be true because the Lands Council’s Mike Petersen said so in exactly those words when I asked him why the Council had unexpectedly dismounted from their Litigation Horse and saddled up a Collaboration Horse. “We weren’t getting our needs met,” Mike told me in no uncertain term. And what does Mike’s outfit want? Respect for one thing. The trust of listeners willing to hear them out. And more wilderness – not the millions of forested acres that characterize “Big W” – but protection for smaller, scenic or ecologically significant areas that ordinary people can enjoy without having to hike 25 miles with 50 pounds on their backs. We championed one such proposal that was even publicly endorsed by the Idaho Forest Group, by far Idaho’s largest timber purchaser. Spectacular Scotchman Peaks, northeast of Sandpoint, Idaho was a perfect fit. I know this because its rocky reaches bordered my Albertson grandparents cattle ranch. It was a half-day hike away from the shores of Pend Oreille Lake, and the hike was easy enough for most tourists. Lots of local groups, including the Sandpoint Chamber of Commerce got behind the idea. But it still went down in flames because of an ill-conceived advisory vote conducted in Bonner County. But the truth is there isn’t a single acre of wilderness in northern Idaho, so I understand why that’s such a big deal to Mike Petersen and his colleagues. It’s symbolic. It’s the summation of who they are and what they believe. The Scotchman Peaks proposal did not include any productive or harvestable timber land. Its rocky outcroppings are mainly occupied by Rocky Mountain goats, and its most ardent supporters, the “Friends of Scotchman Peaks” actively support the forest collaborative efforts that yield the kind of forest restoration work that Dave Ehrmantrout and his sons and other loggers are doing. What’s the lesson here? The lesson for me is that, after 33 years in this business, we haven’t made much progress on the forestry education front. Many of the old walls, the old misunderstandings, suspicions and hard feelings still divide us into opposing camps. In fact, the 2003 Healthy Forests Restoration Act, which occupied my every waking moment for two years, is the only concrete success I can cite for you, and I have been doing this for 33 years. And what am I doing now – in my 75th year – about this nearly complete lack of success? I’m working. Looking for common ground in which we can all plow deeper. And that’s what I hope all of you are doing, too. We have a long way to go and a short time to get there. The fire ecologists I know and trust tell me that we have no more than 30 years left in which to pull what we can of our national forests back from their ecological collapse. The rest will be lost to insect and disease infestations and inevitable catastrophic wildfire. People living in harm’s way in the rural west know this. The rest of the country doesn’t. But they are learning. Ask the folks who lived in once bucolic Paradise, California if they’d like to rethink their decision to not participate in the Forest Service’s Fire Wise program. Ask the millions living in Portland and Seattle if they’re enjoying the smoke that settles in their environs in July that doesn’t leave until October. Last month we purchased $12,000 in camera and sound recording gear – including a drone – so that we can show our urban neighbors what the west’s wildfire pandemic really looks like up close and personal, and ask them what they think about it. We’re working with Nick Smith on a “Man on the Street” video project in the same vein that we suspect will surprise many – perhaps even lumbermen who think that forestry education is a waste of time and money. I said earlier that I’m enjoying watching the serial litigators squirm. I’m also enjoying watching the forestry education deniers squirm. This winter I’m working on a book tentatively titled “First, Put out the Fire!” In it, I explain how we got into this mess and how we can get out of it by using the best tools at hand: thinning and prescribed fire. Our hope to raise enough money to get a copy of this book into the hands of every member of Congress sometime next summer. We like the timing and we like the new political chemistry. Not all Democrats are enemies of forestry and not all Republicans are friends of forestry. We know this from experience because when it looked like Bernie Sanders might secure the Democrat nomination for President, his campaign office contacted us and said they wanted to talk with us about what they were reading on our website about forestry as wildfire’s antidote. They liked our message. We would have helped them in a heartbeat. No one else asked, so we just keep working. I’d like to close out today with something I wrote a few years ago. We can’t stay much longer because we’re flying to San Francisco in a couple of hours to visit our oldest daughter, who is battling cancer. I was inspired to write what I’m about to read to you after watching a Dodge Truck commercial during the Super Bowl 5 or 6 years ago. The voice-over on the was Paul Harvey, from his radio broadcast reading of “God Made a Farmer,” written in the early 1950s by an unknown midwestern newspaper columnist. On the eighth day, God looked down on the earth he had created and said, “I need an old school conservationist, someone who will care for the forests I’ve created, someone who understands that I planted these forests for man’s pleasure and needs. So, God made a logger. God said, “I need somebody who will get up at three o’clock in the morning and drive a hundred miles into the woods, just to get to the trees I want him to cut, so that my forests will continue to grow and provide shelter for the billions of people who will populate my earth. l need a man with the strength of a mule, who can pack a 40-pound chain saw and a gunny sack full of tools up and down steep hills all day long, rain or shine. So God made a logger. Then God said, “I need a careful man willing to face danger, because working in the woods will be dangerous work. Some men will die there, crushed beneath falling trees or tons of machinery, or killed by a falling limb they never heard. I need an artist who can maneuver a 30-ton machine through a stand of timber without tearing the bark off the trees, then reach out and pluck the three trees that need to be cut without harming the rest of the stand. Then God said, “I need a man with simple faith, someone who doesn’t get discouraged when his prospects look dim, a man who faces every day with a smile on his face, even when he doesn’t know what the day will bring or where he will find his next job. I need an innovator, a problem solver with practical skills that only years of woods experience can teach, a man who isn’t afraid to try something new, even if the textbooks say it can’t be done. God said, “I need someone with the constitution of an ox, someone who isn’t afraid to get his hands dirty, someone who sees opportunity buried in life’s disappointments and will keep going when nothing else seems to work. I need a mechanical wizard who can fix almost anything, anytime, anywhere with a nine-sixteenths socket wrench, a screwdriver and a roll of duct tape, someone who won’t quit on me on the nights when he’s still working in his shop at 2 a.m. fixing what he couldn’t fix in the woods 18 hours earlier. “I need a man with the patience of Job, who can overlook the insults hurled at him by people who have no appreciation for the wonderful work he does, someone who will explain for the umpteenth time that forests aren’t fragile, that the last forest will be replaced by the next forest and that trees turned into lumber are the best building material I ever made. So God made another logger. Previous post What Do You Want From Your Forest?